As we began to create this year's Haggadah, we were faced with the immediate issue of language. While we recognize the merit of using female imagery to uproot the assumption that the Eternal is male, we feel that feminizing blessings is not enough. Replacing the word "King" with the word "Queen" may aid us in changing the way we envision the "gender" of the Infinite, but this change does nothing to break down our underlying perceptions of the Eternal as ruler and of ourselves as subjects. In an effort to rid ourselves of our understanding of the Infinite as transcendent and dominating -- in an effort to replace this hierarchy with mutual relation and community -- we have chosen to express all blessings in gender-neutral language. My reaction to that paragraph now is complicated. On the one hand, I remember the Rachel who, at nineteen, wanted so deeply to replace power-over with power-from-within. I still like the point that replacing "King" with "Queen" is only a certain kind of change and may not shake up our calcified notions of God sufficiently. Then again, at thirty-one I'm starting to recognize that though "ruler" is far from the only metaphor I want to use for God, it's a powerful metaphor which I don't necessarily want to scrap. I suspect I needed to spend a while embracing terms like Wellspring and Source and Breath of Life in order to reach a point where I could relate to melech ha-olam again. We struggled mightily with the Ten Plagues. One year we paired the Ten Plagues God Brought Upon the Egyptians with the Ten Plagues Humans Have Brought Upon Women; another year we tried connecting each plague to an issue in our collegiate lives. One year we closed the description of each plague with "Tonight let us rededicate ourselves to...," connecting each with an action or intention we thought was an important part of tikkun olam. Replacing the word "King" with the word "Queen" may aid us in changing the way we envision the "gender" of the Infinite, but this change does nothing to break down our underlying perceptions of the Eternal as ruler and of ourselves as subjects. What's more, God-language should not be exclusive of either gender: both female and male were created in the image of the divine. Our language is insufficient to describe the divine, but we do the best we can, bearing in mind that while our words only approach the Infinite, all language spoken from the heart has God in it. In the changed ending to the paragraph I see a far more sophisticated understanding of how diverse and variable God-language needs to be. And the way the "on language" paragraph shifted, year to year, replicates for me an evolution I see in the larger Jewish feminist community. First we replaced masculine terms with feminine ones; then we side-stepped the binarist paradigm (and the hierarchy encoded in the "ruler" metaphor) by using non-gendered language; then we came to recognize the holiness in all of these forms. In some ways it's a messy shift. Acknowledging the value of a variety of names for God means we no longer have the comfortable and predictable familiarity of "Baruch atah, Adonai, eloheinu melech ha'olam." For me, though, that's a reasonable price to pay to have liturgy that reminds me of God's infinity, paradoxically encoded in the finite words we use. As the project grew, we began to work on making it beautiful instead of purely functional. More and more poetry peppers these pages as the years go by: Rachel Hadas, Adrienne Rich, Naomi Shihab Nye, Merle Feld, Marge Piercy, Melanie Kaye/Kantrowitz... This, too, strikes me as an important evolution. It shows that we trusted our message (women have voices too; the Passover story of liberation reverberates in our own lives; our stories need to be told) enough to add ornamentation and flourish. By that point we were well-versed in other feminist haggadot. We quoted from E.M. Broner and Naomi Nimrod's The Women's Haggadah. We borrowed a fantastic reading ("How does the journey to freedom begin?/ Once, and then again and again...") from The Journey Continues, the Passover Haggadah created by The May'an Project. That year was the first year we placed an orange on our seder plate. We'd learned the story slightly wrong -- it would be a few years before I read Susannah Heschel's original account -- but we had the general concept down. "Women," we wrote, "belong wherever Jews carry on a sacred life." Indeed. The last edition that I own is from 1999, the eighth annual Williams College Feminist Haggadah. I was no longer involved with the project, having graduated two years before, but I attended as a guest. The shift toward increased liturgical sophistication, toward more Hebrew terminology, continued. And the 1999 haggadah had an appendix at the back which collected readings from previous years' haggadot. And there my tangible bundle of history ends. Some years later, a woman I had known from the Williams feminist seder project contacted me about contributing a reading to The Women's Seder Sourcebook, an anthology which arose from the roots of the Yale Women's Seder project (which began in 1993). She told me that the Williams seder had continued beyond my time -- though today when I check the campus calendar I don't see it listed. I guess the days of the Williams College Feminist Seder are over. Perhaps the student community no longer feels the need. Perhaps the dialectical tension of having two seders (a "traditional" one and a "feminist" one) has led to the synthesis of having a single seder which simultaneously fulfils traditionalist and feminist ideals. 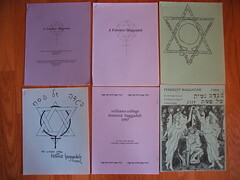 Looking back on all of these haggadot now, I can trace the community's evolution through the years I was there. We wrestled with important questions: what does it mean to be women, and to be Jews? What does it mean to be feminists? Does our feminism influence our Judaism, or the other way around? Do we seek to tell stories which have never been told -- or to tell the old stories, but in a new way? How do we understand the Holy Blessed One, and what words can we use to signify that ultimate reality, knowing that our words are insufficient but that they shape our lived reality in deep ways? What we created was patchwork. Some of it was academic in tone, some poetic; some was traditional, some transgressive. Some of it came from me and some from every other woman who linked herself with the enterprise. Sometimes I think the most important thing was the way we had to wrestle together with the texts -- and, sometimes, wrestle with one another -- to arrive at something we could collectively and communally call our own. With the benefit of hindsight, and more experience with liturgy and ritual, I can see that some of what we did was clunky. The process may have been more valuable than the result. Then again, some of what we wrote still ripples through the haggadot I make today. Beginning with a note "on language," to explain my take on how to verbalize the Divine; reading Rabbi Lynn Gottlieb's poem about bedikat hametz, and following it with an invitation to name a personal hametz one intends to discard -- these are traditions I learned from the women of the first feminist seder on my college campus, and I cherish them still. Memory is not a static deposit; it is neither rules nor happenings that confront us unchanging. As members of living communities, Jews continually re-remember; we retell and recast the Jewish past in light of changing communal experience and changing communal values. The Williams College Feminist Seder project taught me that the words I pray belong simultaneously to the generations of tradition and to me. It gave me a sense of ownership of my tradition, and empowered me to add my voice to the chorus. It sounds a little corny now, but in some very real ways it set me on the path toward who I am and who I hope to become. Technorati tags: religion, Judaism, feministseder.